as soon as you throw a cross in the ring things will change. there are at least2 different genes that govern white, one is dominant and one recessive. they also behave in different ways and getting a true white white also involves other genes. I'm picking this comment up from a past thread. I have six white offspring (fully feathered, 3 months old) from coloured parents, therefore I assume that they have inherited recessive white 'c'. However, one bird has a single black feather. What does this tell me about his genetic makeup, please? 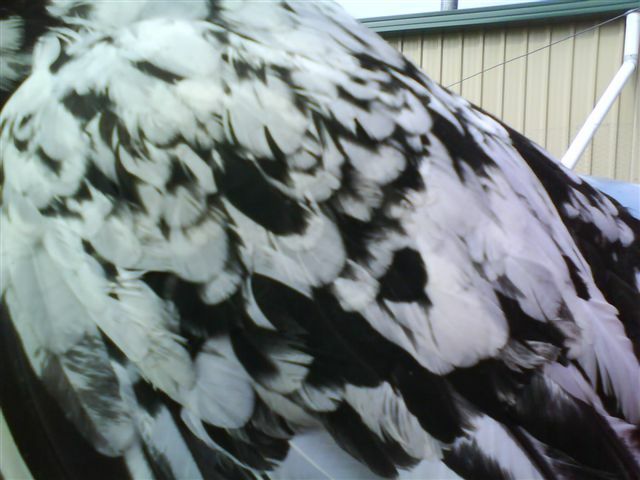 Recessive white is leaky, it only turns the pigment off in the feather so the bird is white, but genetically if is still the same underlying colour of whichever breed it came from. Ultimately if you have two plymouth rocks and a white offspring comes from them it is recessive white, it has to be present in both parents and has to be homozygous to be shown. So both parent must have the gene. To replicate breed father to daughter and mother to son. Even sons that may not be white will carry one copy of the gene if both parent obviously had it. I understand. So two recessive white birds may still carry underlying 'invisible' patterning which can be inherited. But why does an odd black feather appear in the otherwise completely white bird? I could be about 500 miles off the mark here, but I know that in some animals colour related genes are turned on and off at specific sites. A tortoiseshell cat is like this - colour related genes are turned on and off in specific cells, so you get some red patches, some white patches and some black patches. I wonder if it works like that in chooks too. what type of chooks are they, I have plymouth rocks and get occasional smuttiness in some feathers but not whole black ones, from what i have read and been told i inhibit both black and red it just isn't perfect at it do some leakiness comes through, supposedly the addition of blue can also affect the brightness of the white. Recessive White is said to be 'leaky' which means it's action is not perfect. It will occasionally 'allow' the odd black feather or greyish shade, but will totally suppress gold/red tones. They're (bantam wyandotte x bantam buff sussex) x buff sussex. The wyandotte was an imperfect black with some gold lacing. I assume the white comes from the sussex. Sorry David, my post crossed with yours. Sorry if I don't know exactly the right way to ask this, but what does 'leaky' mean at a gene level? What is actually happening when a colour is 'let through' in some feathers and not others? If the answer is too technical and complex to explain in a post I'll understand At a more basic level (perhaps) is leaky a technical term used by geneticists or a simply a term used in bird breeding? I think it is used by both, and possibly refers to variations in the biochemical reactions at a cellular level. I think exchequor is to chooks as tortoise shell is to cats. Lizzie, to make the whitest whites, other genes that inhibit colour are also added. Double dose Blue (splash) Dominant white, lacing and barring are common. tortoise shell cats very rarely produce males...all females..no relation to excheque which is most likely mottling. recessive white can cover anything. it could be a perfect breeding laced, gold, silver, cuckoo etc etc etc. the basic genes are unchanged, just they are unable to express themselves as all colour is inhibited from being produced....BUT the genes are still there. I understand. Looks as if breeding a pure white is more difficult than it sounds. Unless the breed has been white 'for ever', like white leghorns? The other problem is leg colour. Is that inherited quite separately to feather colour? yes different genes make up the different characteristic of the fowl. Back to the drawing board, then. I need to study more chook genetics. And thanks for your help.